Right so CHRIS frickin' BLATTMAN is reading. I'd better think of something clever to say. .....Nope. Nothing. Too much pressure. Instead I'm just going to post this AWESOME photo from The Citizen of H.E. 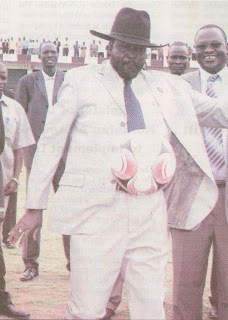 Salva Kiir Mayardit, President of Southern Sudan, looking very cool as he opens the first ever international football tournament in Juba last week. If you're interested Your Excellency, we normally play on Tuesdays at the UNMIS pitch. You are more than welcome.